Hi! I`m a sweet peach faced lovebird that was affectionately named Shasta. I can`t let anyone know if I`m a male or female or my age (I don`t speak human and they don`t speak lovebird!) but I was found roaming the street in Sunnyvale trying to survive when someone found me and brought me to the local shelter. Then the kind folks at Mickaboo heard about me and before I knew it my foster dad came and sprung me and I was in a nice home with my own roomy cage and good food to eat. Talk about things looking up! I admit this has been a lot for one little bird to take in but I have been a pretty mellow birdie and seem to like the attention from my new human friend so I may become a very friendly lovebird. 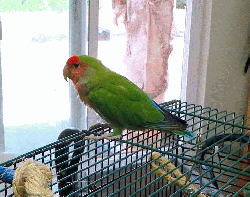 So, if you wanna meet a sweet lovebird like me just give let the folks here at Mickaboo know. Notice: Lovebirds are flock animals, and most of them form a very strong bond with another Lovebird. We have found that when single Lovebirds are kept alone they are more likely to experience behavioral problems including feather picking & mutilation. Because of this, unless a household currently includes another Lovebird, Mickaboo usually requires a minimum of a pair of Lovebirds be adopted. Update- Shasta has bonded with Minnie and they need to be adopted together.